As the last sunflower lost it’s petals and everyone had a beginning touch of the flu. We made a delightful crumble. 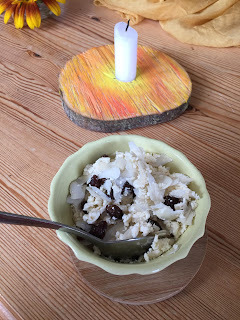 By mixing drained quark with egg, boiling it and adding some raisins and sliced almonds. Very nice as a little snack, rather surprising and without any fat or sugar. Can’t beat that can you?! Life is quiet here at Pale Rose. We are enjoying ourselves as usual by cookkng, crafting and reading. Not much on tv and I like these weeks of easy sailing before the preparations of the Holiday Season. Are you also experiencing a few weeks of calmness? Ever made a quark crumble? 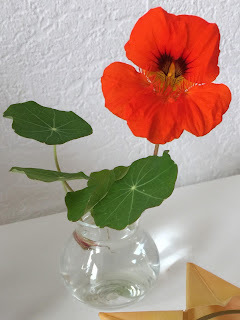 Found a flower growing in your garden despite the cold weather? Do tell! !